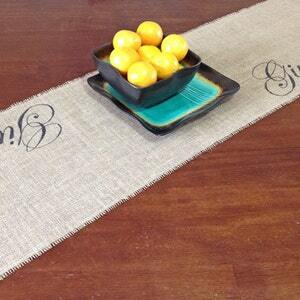 Whether you are decorating your table for a holiday dinner or gifting this charming burlap table runner with year round use in mind. 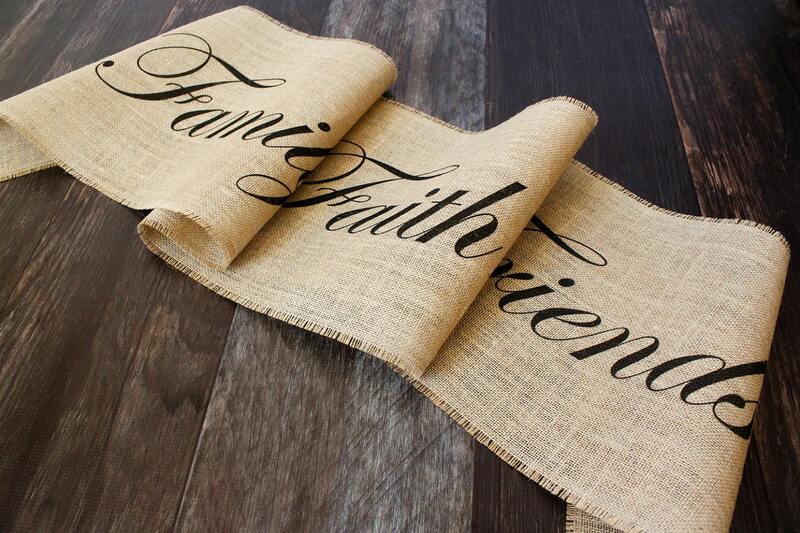 Family Faith Friends perfectly states the joyous company of friends and family gathered in God's love! It's also a fantastic way to protect your dresser, sideboard or bureau table from scratches and scuffs. 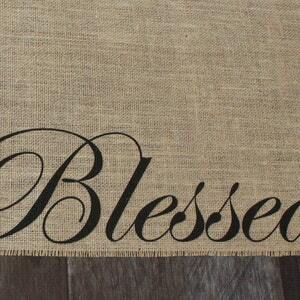 Burlap is a fantastic medium because it is so versatile. It compliments a wide variety of styles; rustic, shabby chic, eclectic, contemporary, cottage, vintage, rustic, natural.... the list goes on and on! 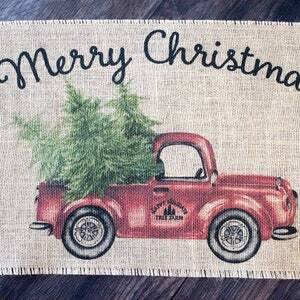 It's also a unique and personal item for gift giving because there's no need to guess someone's home decor style, burlap fits right in regardless. 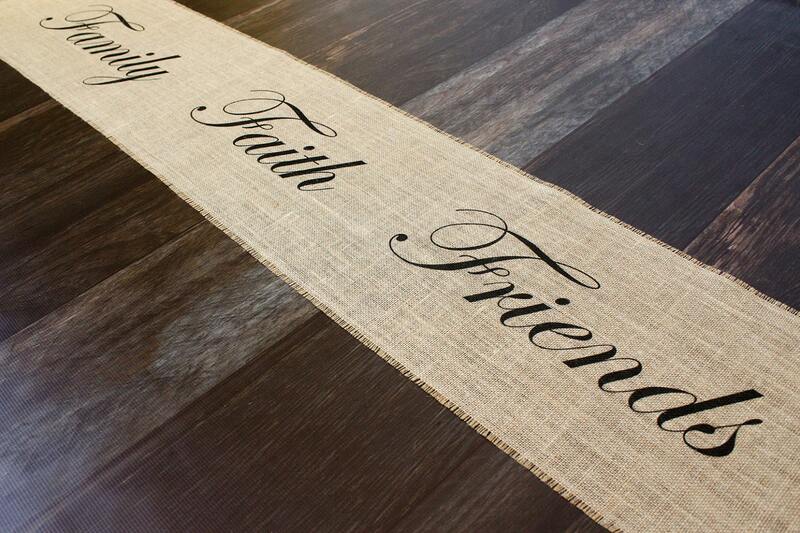 This listing is for a table runner with Family Faith Friends in large script, evenly spaced down the middle. The runner measures 12" x 64" It is personally designed by me and printed directly onto the burlap with specialty textile ink; no paint, no vinyl, no stickers, just burlap. 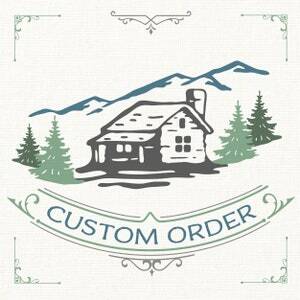 I am a stickler for quality and go to great lengths to source premium jute burlap. I get my burlap directly from a mill on the East coast for its tight weave and smooth texture. I intend for my creations to grace tables for years to come! The edges are frayed then sewn to prevent further unraveling. Because burlap derives from the natural jute plant fibers, there may be slight variation in color and texture, which add to it's natural charm. Hand wash please.